High resolution digitally printed splashbacks are printed using the very latest in printing technology. Software for image processing, along with seemingly unlimited colors of glass inks create the best when it comes to printed splashbacks. Anything you can dream of, or any high resolution image can be printed directly onto your glass kitchen splashback using a high precision glass printer. If you want to capture the sunset, sunrise, or even a sky full of stars, it is now possible with digital glass printing technology. You name it, you can print it, and bring to life any colour in your decorating palette. What Are Some of the Digital Applications for Printing On Glass Products? There are many wonderful applications for digitally printing on glass. At MyColourGlass we provide high resolution and long lasting printing on the following toughened glass products. Kitchen & Bath Splashbacks- The marvels of high resolution printing on your kitchen and bath splashbacks are seemingly endless. You can create any environment you want with the millions of images available on the internet (such as on Shutterstock) and elsewhere. Start image shopping now for the perfect print solution. 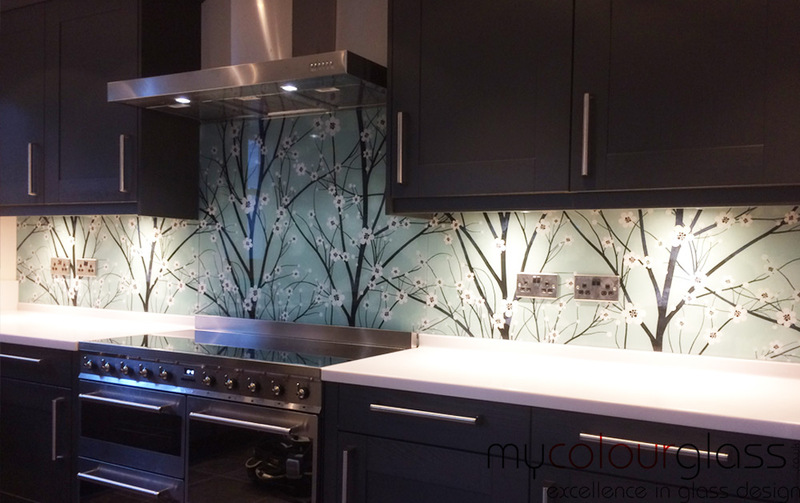 You can sit down with your own personal designer, or even get together with the experts at MyColourGlass, in coming up with the perfect design or print solution for your splashbacks or splashback. You definitely won’t want to stop with the kitchen, but will want to carry this process throughout your entire decor. Certain Van Gogh paintings, such as a field of sunflowers, or “Starry Nights”, and even “Almond Blossoms” will add an element of surprise and an illusion of texture to your kitchen splashback. All of the old master paintings are in public domain, for your usage, as far as prints go. Balustrades & Balconies- Balustrades and balconies look tremendous with digital glass printing. Pick out designs in your existing decor for your stair balustrade and create a stunning effect. Lime green contemporary plant prints would look really good waltzing up your stairs on see through toughened glass. Can you imagine driving down the road or highway and spotting a digitally printed balcony, or maybe several. A digitally printed balcony would look tremendous on a cliff side setting near the sea, especially with the lights of night shining through in a deep purple and a splash of a full yellow moon. You could even go “Herring Gulls” (birds) if you so desired. Wall Dividers & Partitions- Wall dividers and partitions have the same creative art possibilities as your splashback when it comes to digital painting. Sometimes a “cut out” print looks great on a wall divider, or room divider, such as a silhouette. These can be very contemporary when placed on a luminous type tinted toughened glass. The weather has no effect on toughened glass digital printing and can also be used on the patio or near the entrance as a partition. Cactus would look very nice as a setting for a rock garden. It would be a definite wise investment when it comes to all of the wonderful things you can do with digitally printed glass in your home and business decor. Take time now and shop around at MyColourGlass for the best in ideas and contemporary design when it comes to digitally printed splashbacks.